Blepharoplasty, also known as eyelid lift, is a procedure to remove skin and to add or remove fat from upper or lower eyelids. Eyes are the first area to be noticed when people look at each other. Therefore, aging signs of the eyes are usually the first areas to be noticed at and judged by other people. The main symptoms of aging are drooping eyelids on both upper and lower eyes due to excess or lack of fat and muscle weakness. There are several procedures for anti-aging eye surgery. It is very important to have an accurate diagnosis when choosing the procedures. The proper procedure for individual is depending on the severity of aging process. General price guide line for blepharoplasty is USD$1,600 to USD$2,800 according Korea Health Industry Development Institute. The price is decided depending on the method and difficulty of patients’ case. What is Upper Blepharoplasty surgery? Upper eyelid excess skin and fat can create a heavy looking eyelid, aged appearance, puffiness and sometimes block the upper field of vision. Upper blepharoplasty surgery uses incisions to allow for removal of unnecessary skin, fat, and muscles due to aging for a youthful eye appearance. This procedure not only corrects aesthetic problems but also functional problems of the eyes. With upper blepharoplasty, facial wrinkles around the eyes are reduced, thus creating a milder impression. Therefore, it is also known as the representative surgery of anti-aging eyelid surgery. However, scars are visible if the surgeon doesn’t understand the patient’s skin condition. Who are the candidates for upper blepharoplasty? Lower blepharoplasty is surgery to correct droopy and wrinkled skin under the eyes through incisional method. Excessive droopy skin tissues are removed in order to make the corrugate area flat. Also, the fat under the eyes can be added or removed or repositioned through incision at the same time to flatten the under eye area. Under eye bulging or sunken symptoms can create very tired and aged appearance. However, lower blepharoplasty can improve the tired and aged impression and can create a brighter facial complexion. With upper blepharoplasty, upper blepharoplasty is also a representative surgery of anti-aging eyelid surgery. However, too much skin removal can cause ectropion of the eyelid, in which the eyelid is turned outwards away from the eyeball. Who are the candidates for lower blepharoplasty? 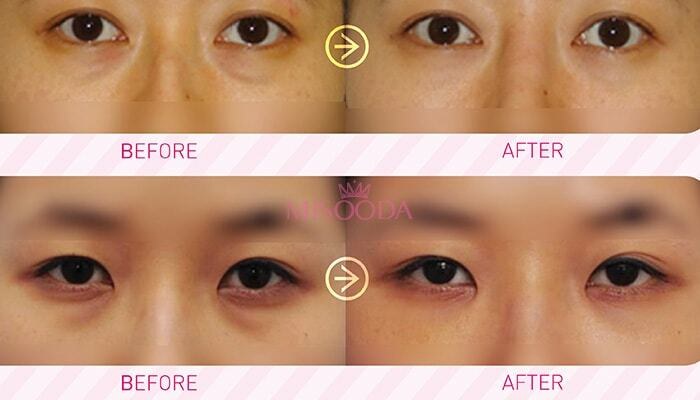 Browlift is a procedure that keeps the existing double eyelid line and only lifts the droopy eyelid. 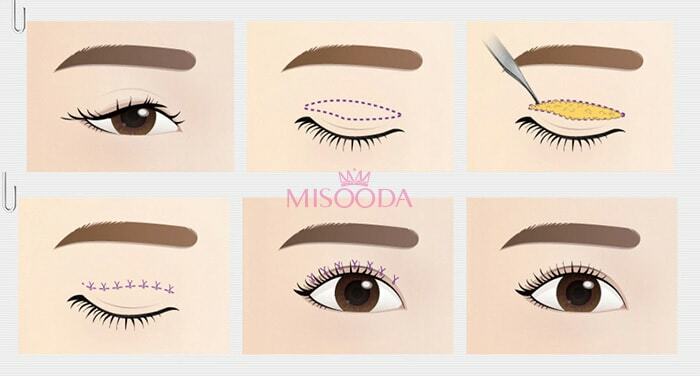 The incision is made along the eyebrow line which can be made either above or below the eyebrow. The droopy skin and muscle is lifted and removed through this incision. It is considered as an easy procedure but very effective. Browlift is preferred by people who already have double eyelids or want to keep their existing impression. This procedure is not only correcting the aesthetic problem but also the functional problem of eyes. Brow lift improves eyelid wrinkles to make the eyes look bigger and brighter. Who are the candidates for browlift? What is Under-Eye Fat Repositioning surgery? Under eye fat repositioning is a procedure that corrects the droopy eye bags, often caused by age. Patients with under-eye eyebags can look order than their actual age and often look very tired. The under-eyes can appear either protruded or sunken due to eyebags. Fat deposits can be removed or repositioned in accordance to the patients’ diagnosis in order to make under-eye flat and improve dark circles. However, if the fat is excessively removed or not repositioned properly, it can cause recurrence or wrinkles may worsen. Who are the candidates for under-eye fat repositioning?